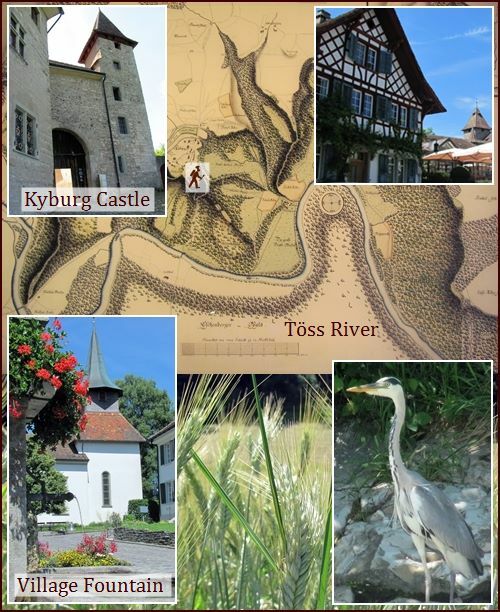 While my sauerkraut was drying on Friday, I took a 50 km bicycle ride along the River Töss to Kyburg Castle and back home through the countryside. The ride showcased everything I love about Switzerland: bicycle friendly routes, fields with diverse crops, small working forests, villages with fountains, and historic buildings – mostly still in use. Kyburg Castle is over 1000 years old and is now a museum. 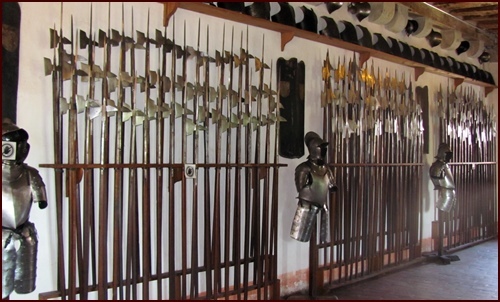 I toured the courtyard, worship room, living and cooking areas, tower, a room filled with armor suits and spears, jail, and torture chamber. The middle ages were no picnic except for the privileged noble class that inhabited the castle for most of its history. The peasants, also called subjects, labored outside the castle walls cutting wood, hoeing fields for grains, and raising chickens and cows. Farming thrives today in Switzerland with modern tools. We are blessed with locally grown food and a splendid view of the fields when we pass by on our bicycles. I wouldn't want to find myself on the business end of those spears. 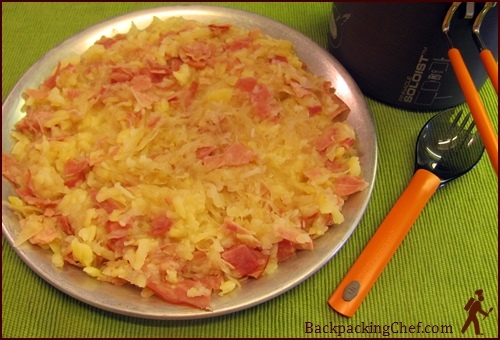 I dried a mixed load of grated potatoes, sauerkraut and thinly sliced ham at 120° F on four trays for about six hours. You can dry sauerkraut on a mesh sheet without a non-stick sheet if you drain off the juice or you can use a non-stick sheet if you want to include the juice and then remove the non-stick sheet after the liquid is dry. Dried sauerkraut looks a little like birds nest material. Pull it apart before you add it to the meal. A little over a pound (500 g) of sauerkraut yielded ¾ cup dry. Two pounds of grated potatoes – steamed first – yielded 2.5 cups dry, and four ounces of ham yielded ¾ cup dry. The tangy flavor and high sodium content of sauerkraut make it a dominant ingredient in this simple meal – you don’t need any other spices or extra salt. 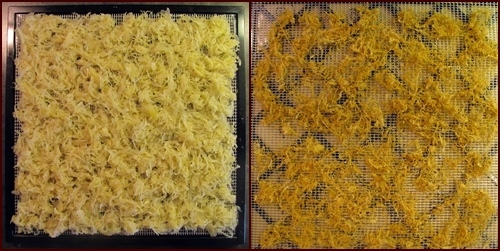 However, I did salt the grated potatoes when I had them spread out on the dehydrator trays. The ham provides the chew in this otherwise soft textured meal. Sauerkraut is high in vitamins C & K and is also a good source of iron and fiber. I cooked the meal in a GSI Outdoors Pinnacle Soloist pot in the usual way – soak all ingredients in water for five minutes, light stove and bring to a boil for one minute, turn off stove and let sit for ten to fifteen minutes. This meal can be prepared in a freezer bag or other container by adding the boiled water to the food in the container and waiting until the water is absorbed. 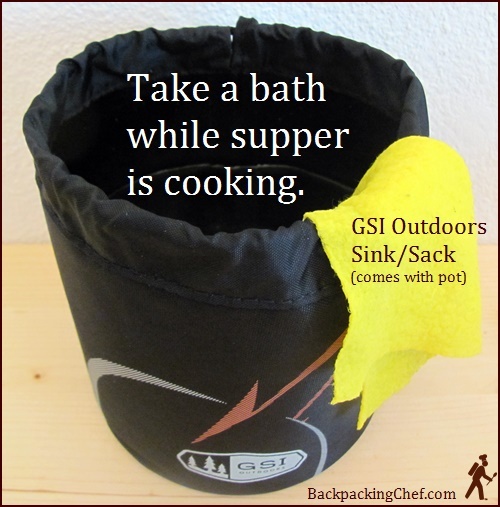 When I was on the Appalachian Trail last month, I met someone who was cooking with a GSI Outdoors pot. What caught my eye was the sink/sack that the pot stows in. I won’t use it for cleaning the pot, but I will definitely use it to clean myself before dinner. A six inch square of microfiber cloth makes a good washcloth. I purchased the Soloist (1.1 liter capacity) and the larger Dualist (1.4 liter capacity) and will do a thorough review after I use them a few times. So far I like what I see. The handles are sturdy and fold securely over the lids when stowed. The pots come with extra components – bowls, cups, plastic spork – that I probably won’t use. But, the pots are good and the sinks hold over a liter of water so I can make myself presentable before sitting down to a great meal. That's it for this month. Dominique and I may ride our bicycles to Germany in July for a weekend over the Rhine. Dominique gave two-thumbs up for the Potatoes with Sauerkraut & Ham. I hope you enjoy it also. If you are using a GSI Outdoors Soloist or Dualist pot, please let me know how you like it. Thanks. Visit my Facebook page for the lastest posts.